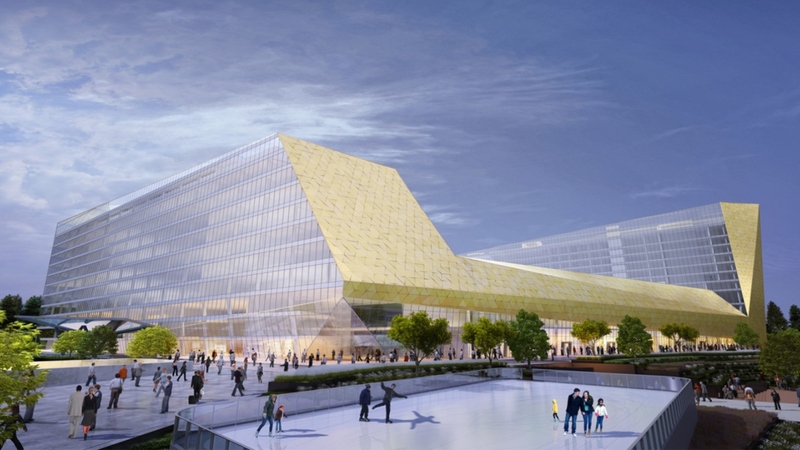 Magnet Minsk is a multi-purpose complex with diverse recreational and business utilisations including; 53,200m2 of retail space that incorporates a shopping mall and supermarket, an office centre, a high-rise 5* hotel and luxury apartments. The project is located along the main arterial road that leads from the city centre to the international airport. Ramboll provided Building Services, Structural Engineering, Civil Services, Facades, Fire, Acoustics and Vertical Transport services. The building is formed using reinforced concrete frames with pad and raft foundations and, to give the development a strong identity, a crystalline form was adopted for the building façade. Located under the development, a 2 storey basement provides access to a supermarket and parking areas and shields visitors from the extremes of the local climate. A 4 story retail development is provided over the basement flanked by an 8 storey office, a 10 storey hotel and 6 storey car park. The total project is approximately 150,000sqm.